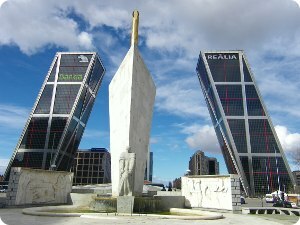 It is the financial district in downtown Madrid located along Paseo de la Castellana. The little "Manhattan" of Madrid. It's original conception dates back to the "Plan General de Ordenación Urbana de Madrid", in 1946. The purpose of this plan was to create a huge block of modern office buildings with metro and railway connections in the expansion area of northern Madrid, just in front of Real Madrid stadium (Santiago Bernabéu Stadium) and beside the brand new government complex of Nuevos Ministerios. The construction began in the 1970s after many delays. Nowadays some of the tallest and most beautiful modern Madrid skyscrapers are placed here. 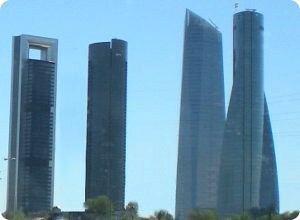 The most important are: Picasso Tower (157 m), Europa Tower (121 m), Banco de Bilbao Tower (107 m), Kio Towers or "Gate of Europe" (two twin towers, each building is 115 m tall with an inclination of 15°, was the first inclined skyscrapers in the world). In February 2005, Windsor Tower (106 m) was destroyed by a fire. And, in 2007 was replace by other tower, work started in 2007 and continued until completion in 2012. The new building is called the Titania Tower (104 m). 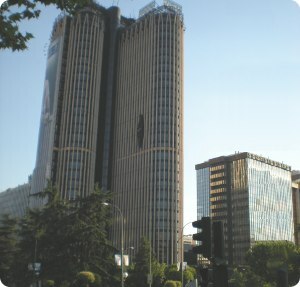 In 2007, a new skyscraper area was built farther north with four buildings: Caja Madrid Tower, Sacyr Vallehermoso Tower, Cristal Tower and Espacio Tower. The first is the highest in Madrid and Spain, with its 250 meters high and 58 floors. * Picasso/Europa Towers: Line 10 - Santiago Bernabéu station. * Kio Towers: Line 10 - Cuzco station. * New Skyscraper: Line 10 - Chamartín or Begoña stations. The best option is to get off Nuevos Ministerios station (Line 10) and stroll along the Paseo de la Castellana north to view all towers, starting with Titania Tower.